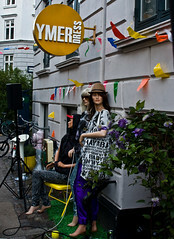 Went to a little street party last Saturday in the cosy Nansensgade quarter of Copenhagen. The groovy shop Ymer Dress was celebrating their new website and, not least because it's summer, it was a good enough excuse to slap some tables out on the street, get a DJ and let the vibes, tunes and beer/cider roll in the neverending light of a Copenhagen June evening. Here's Kristine, owner of the shop. She has a cool old three-wheeler covered in bamboo parked outside. I got her to mosey on down the street a bit to a splash of sunshine and photographed her there. Yes, the tyres are flat, but the bike is cool, as is she, as is the shop. What a cool little party it was. Perfect warm-up to heading out on the town. Thanks for the beer! Ymer Dress should definately be on your shopping hit list if you're visiting Copenhagen. It's at Nansengade 38. Regarding our post about The Good News and The Bad News About the Cycle Chic Movement, here's a couple of sensible pieces. Our friends at Cycle Chic Belgium posted about an article in a Belgian newspaper about the Cycle Chic movement - Copenhagen Cycle Chic was mentioned, bien sur. The paper interviewed two women who ride each day. Good girls! And a good message to end the article, so all is good. 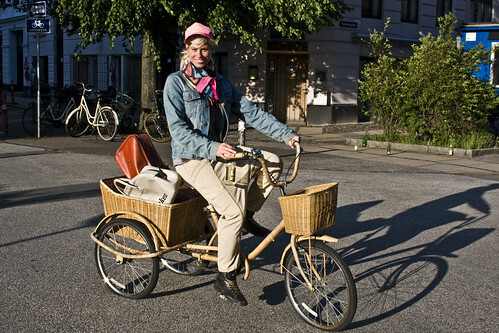 And on the other side of the Atlantic, the Bike2Work2Live2Bike Blog has this post about suitable cycling clothing. His local bike shop has a mannequin in regular clothes and a little sign reading "This is Appropriate Cycling Clothing" attached to it. Some people, at least, get it right. For appropriate cycling clothes, open your closet. It is very comfortable and we can carry luggage on it. I try and explain to my friends that it's not about being high-fashion, just no spandex. In Flagstaff, high-fashion is a hoodie fleese pull-over with a skort and Tevas (painted toe nails, please). It's just my normal clothing. Yesterday, it was a sleeveless dress with leggings for warmth on a cold morning, high-heels and a NorthFace pull over. Hardly a huge fashion statement but I looked pulled together and was ready to get to work once I reached my desk.